As I look back on the last decade I am extremely overwhelmed with gratitude for all that I have been blessed with. There have been very difficult times but also the happiest times of my entire life. 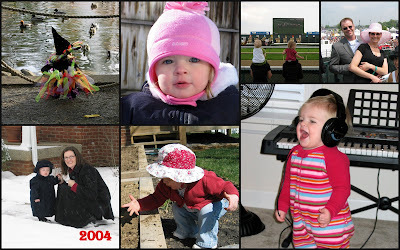 As this new decade begins, I would like to recap some of the highs and lows of each year. 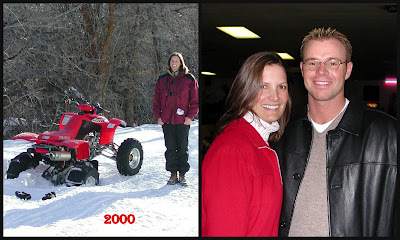 2000- The year started out with a huge and painful loss. My grandma proved to all of us that there was something to fear about Y2K. Grandma was NOT Y2K compatible. She died very early in the morning on the 2nd of January after she threw a blood clot from a broken leg. The doctors wouldn't fix it the week before when they found it because it was considered "elective" surgery and they wouldn't do elective surgeries for 2 weeks prior to Y2K- just in case. The year started out on a difficult note, but the rest of the year was wonderful. I started work at Novell and I taught seminary at Alta High School. I was dating more than I ever have and then I met him, the "Hottie in the office" and was excited that he didn't wear a wedding ring because he wasn't married. 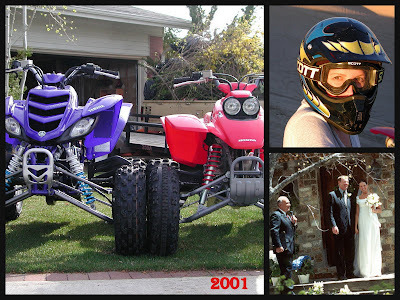 The courtship began in September of 2000. We went duck hunting and I got my own waders. It was at that moment Scott knew he could marry me, but it took him a few months until he knew that he wanted to marry me. 2001- Scott Sanford proposed to me. Both versions of the story are worth sharing- but I'll save those for another day. On May 5th, we were married at my Uncle's cottage in Sundance. It was a perfect day. That fall Scott started graduate school and I continued to work. 2002- Scott did an internship with Ford in Michigan and we found out that we were expecting Jade. We were also sealed in the Salt Lake Temple for eternity. 2003- Jade joined our little family and I learned a whole new meaning for happiness. That summer we moved our little family to Louisville, Kentucky where we bought our first house. We loved getting the yard put together and decorating the house to be our home. 2004- Scott and I enjoyed the rainy season in Jamaica for a getaway without Jade. We got to go to the Kentucky Derby and my cousins came out to experience it with us. It was the first rainy Derby in decades. 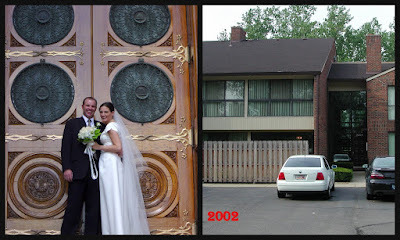 2005- Jade and I headed to Utah where I took a job with LANDesk, Scott took a promotion and moved to Michigan. It was extremely difficult being apart but we went back and forth as often as possible. The week before we moved, we found out that Ivy would be joining our family in January. Scott and I got to go to a NASCAR race with Josh and Lisa. We also enjoyed the luxury suite at the horse races. Soon after that Josh and Lisa tied the knot. The next day I was put on bed rest for preterm labor. Jade and I joined Scott in Michigan for the rest of the pregnancy and we love finding the fun in Dearborn. 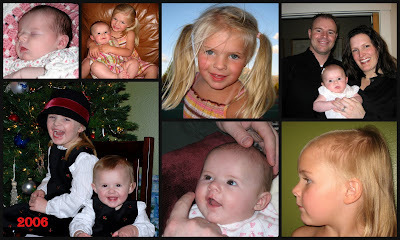 2006- The year started out with Ivy joining our family in Dearborn, MI. Both sets of grandparents came out to help and play in the cold of Michigan while we explored Frankenmuth. In the early summer, our family was reunited in Utah where we bought a lot and started to build our home. We lived in my grandparents' condo for a season and were grateful that Scott got a job with Novell. 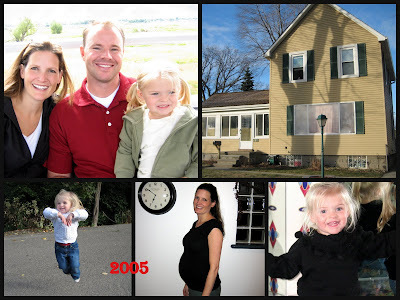 2007- We moved into our new home and spent the rest of the year getting the house and yard put together. In April we took Jade and explored Germany and Austria in our new car. Ivy stayed with our nanny and missed us. For work I traveled over 50,000 miles on Delta and 25,000 miles on United- I hope I never have to repeat that again. 2008- Scott and I got to go to Saint Lucia for my company's president's club. 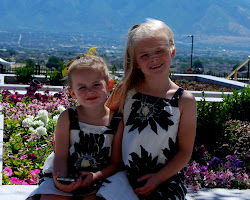 It was a wonderful vacation and the girls had a blast with my parents. I broke my foot on my dad's birthday and had surgery a month later. We took the girls to Disneyland for their first time and they want to go back again and again. For 2009 you can see the recap of the year, here. 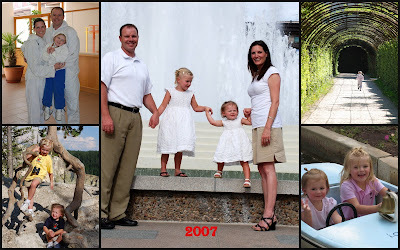 Quite the decade- I LOVED 2000- 2009 and can't wait to see what the next decade will bring my family. Oh, what a difference a decade makes, right? Thanks for sharing this beautiful post! My 3-year-old can't stop talking about Disneyland either. In fact, we "pretend" to go on an airplane or a boat to Disneyland almost every day...and Mickey Mouse has been coming to our house a lot too lately. Her vivid imagination never fails to make me smile.